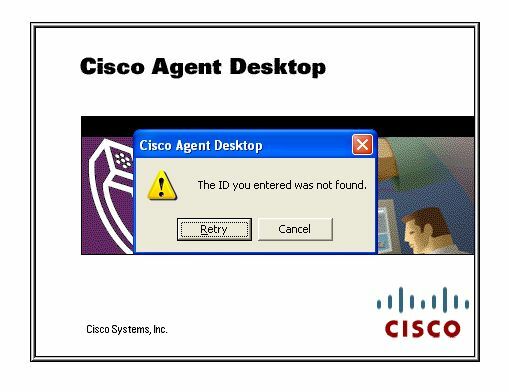 I was looking at this issue for an agent who was getting the following error when trying to login to CAD (Cisco Agent Desktop). The UCCX server was version 7.0 windows Box. You may also need to do a manual Re-synch from Cisco Desktop Administrator. Select Call center 1 and then from top bar go into Setup > Synchronize Directory Services. Also, from top menu go into Desktop Administrator > Side A > A window will pop up. If you get this error after manually trying to synch Dir services then that means you are hitting Bug CSCtg58421. CDAUI2082 At least one error has occurred during the manual synchronization of directory services. When a user ID is updated either through CUCM or Active Directory, the CRS Engine still holds this in memory and causes a sync issue since both IDs are still present. User ID should only be updated when the agent is logged out of CAD. If the user ID is updated while the user is logged in a CRS/CCX engine restart is required to clear the memory of the old user ID. This will require a reboot of whole UCCX cluster and a restart of CTI manager service on all Call managers. can you show how to make a user ID and password for an agent ? Nice work, glad to have discovered this place on blogs list. 2.0 list. It’s a pity that the search engines aren’t giving voiceonbits.